ThE WakkiesT WakkorottI WeB PagE!!! (The WWW Page!) Hellooooooo Nurse! I am yet another ANIMANIACS fan! My name is Tiffany. I'm 24 and live in Pennsylvania. Wakko Warner is my favorite Animaniacs character! If you aren't familiar with the Warner Sibs, there is a summary below. Surf around and enjoy my web page! My Home Page with pictures!!! Yakko is the oldest Warner sibling. He is very smart and a very fast talker. He's usually the one to sing fast songs (like all the Nations of the World!) Yakko wears high, khaki pants with a belt. 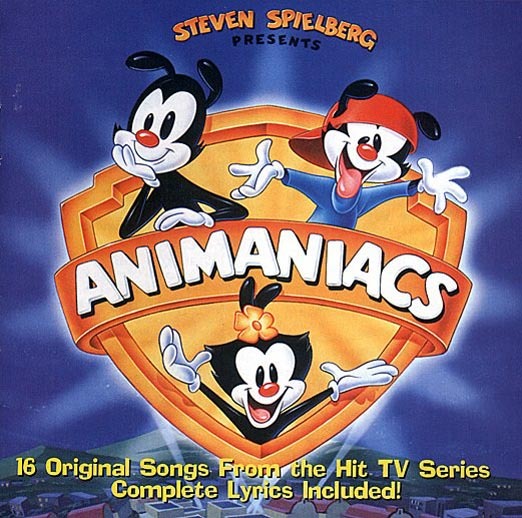 Wakko (AKA "Wakkorotti") is the middle Warner sibling. He is very wacky, and always is saying something funny. He uses words like "Faboo", "Dadoo", and "Hello Nurse." Wakko is always carrying a gaggy bag that holds anything you can think of. Wakko wears a red hat and a blue turtle-neck. Dot (AKA "The Cute One") is the youngest Warner sibling. Dot likes to call herself Princess Angelina Contessa Louisa Francesco Banana Fana Bobesca The Third! But you can call her Dot. Don't ever call her Dottie, she hates that name! Dot wears a pink skirt and a yellow and orange flower around her ears. Wanna check out some cool Animaniacs sounds? Animaniacs Official Web Page Check out this web page, it's the Official Animaniacs Web Page and it is redone! It has goodies, activities, cool links, and stories on the new Wakko's Wish movie. Go ahead and make a Gookie!" Hooray! Finally, Warner Brothers have come out with an Animaniacs Volume One DVD! You can purchase it on Amazon.com or probably other popular places that sell DVDs. This Animaniacs Ring Site is owned by Tiffany "Wakko" . Want to Join the Ring? Visit the Animaniacs WebRing Home Page to find out how! Join Wakko Wakkrotti Warner Webring? Yakko: "Once upon a time, a brave knight married a beautiful princess and they had two sons." Dot: "But they wanted a daughter, too." Yakko: "Right, so they planted a garden all over the kingdom and on the first day of Spring every flower in that garden bloomed. And out of the prettiest flower came..."
Yakko: "Yep! And so the Knight and his bride--Mom and Dad--took you home. And every night at bedtime they'd come in and say, 'Who's the cutest girl?' And you'd say..."
Yakko: "And they'd ask, 'How'd ya ever get so cute?' And you'd say..."
Dot: "I was born that way." Yakko: "And they'd say, 'Tell us your name, Young Lady.' And you'd say..."
Dot: "Princess Angelina Contessa Louisa Francesco Banana Fana Bobesca The Third! But you may call me Dot." Yakko: "And they'd say, 'Can we call you Dottie?' And you'd say..."
Dot: "No. Just Dot. Call me Dottie and ya die." Yakko: "And mom and dad would laugh and laugh and laugh. And they'd tickle ya...(Yakko tickles Dot and she giggles)...and you'd laugh, too. And you'd fall asleep with a great big smile in your heart." Dot: "I like that story." Goodbyeeeeeee Nurse! Thank you for visiting my web site!